Improved robot technologies are mainstreaming into American business. 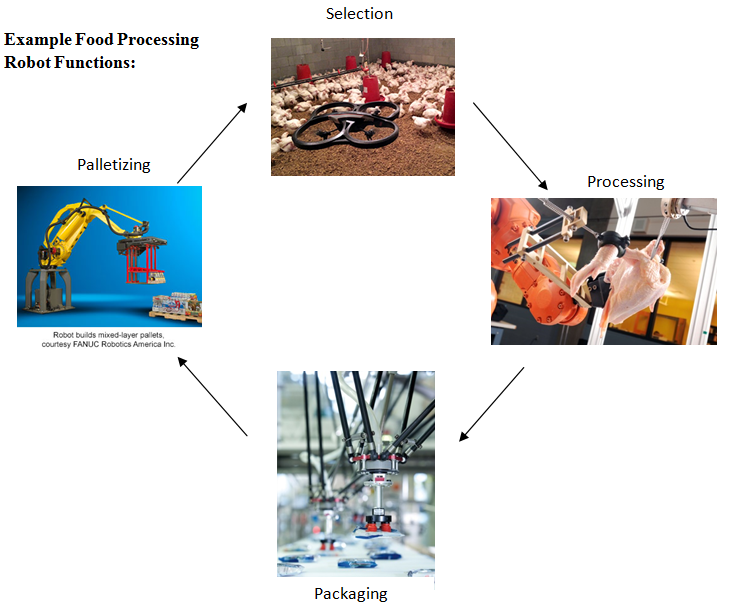 The food processing industry presents tremendous opportunities for new robot technologies because of their cost effectiveness, contamination reducing characteristics and safety improvements in this highly visible and critical industry. In order to have the most efficient food processing plant possible, the smaller the overall production line the better, in order to reduce the time spent on processing, packaging, and palletizing. In previous years robots were too large for small product lines, but now, robotic arm producers are creating smaller arms in order to reduce space and increase efficiency of the overall space. Delta style robots are a very new line of extremely efficient dexterous robots that closely resemble spiders due to their arms that hang down. Delta robots are perfect for picking and placing all kinds of food products. They hang above the conveyor line dangling their arms down in order to pick and place the products where they need to go at a very rapid and efficient speed. Dual-arm packaging robots are also available for their precision and dexterity. The arms can be equipped with different tools in order to handle different jobs. Baxter the robot is a famous example of a dual arm packaging robot . Baxter is currently being used in several different industries. Baxter is the first robot of its kind that is both cost effective for smaller businesses looking for automation in packaging and at a reasonable cost. Baxter is equipped with sonar, a front camera to detect human presence and six degrees of motion for each arm. Baxter is programmed with a "common-sense" capability in order to be able to adapt to any sort of environment change. Robots are made to work in harsh, unsafe challenging environments, and work efficiently. The food processing industry has been fighting cross contamination and worker safety issues since food was produced on large scale. Robots provide an outlet to minimize injuries, avoid cross contamination, and increase overall efficiency. In 2011, the FDA enacted a law entitled the FDA Food Safety Modernization Act, allowing the agency to recall any food that is contaminated, causing major public issues with the food producing company responsible. In the past, robotic arms could only process materials that were all uniform in size and shape. Now with the development of smart sensor technology, robotic arms can look at a product and make a calculated adjustment in order to be able to work with the product the most efficient way possible. Food products, especially meat products are extremely inconsistent in their shapes, sizes, and fat content. Robots are now able to scan the product and make the necessary cuts to get the most product off of the bone, limiting waste and increasing output. So, robots must be able to adapt to the fact that no two pieces of raw meat are alike, and thus they must learn very quickly how to handle the food. Not only do robots have to be able to handle all different shapes and sizes of the meat, but they also have to withstand cleanliness standards. Fanuc Robotics, Adept Technology, Inc., and Staubli are three of the top robotic arm and delta robot manufacturers in the world. Staubli makes all of their robots as adaptable to every single kind of industry that may require one of their products. Staubli prides themselves on being the producers of some of the most reliable robotic arms on the market today. Adept specializes in producing 4 axis as well as Delta style robots that can be used in all industries as well as food grade packaging arms. Fanuc is the worldwide leader in food grade robotic arms. Fanuc produces the fastest smart tracking robotic arms on the market, which is important with the food industry, since many perishable products are under time constraints to avoid spoilage. The following diagram illustrates a full robot food processing line. Presumably this technology will evolve and the entire food processing line will be completely automated with limited human involvement. In order for farms to remain profitable, emerging technology applications are crucial in order to stay afloat. Drone surveying is currently being explored to check crops for parasites as well as overall health. 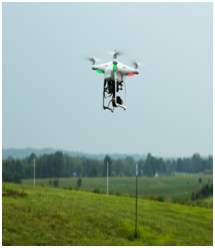 Using drones allows for rapid analysis of the crop that could not be reached previously unless an airplane surveyed the farm. Drones can also help with data collection to assist in the decision making process of how much fertilizer to use or pesticides, to apply in order to reduce runoff and help protect the environment as well as reducing the farmer's costs. In January 2014, researchers at Georgia Tech began a three year poultry project to attempt to reconstruct cutting and deboning systems, so it can rival the most experienced human poultry processor. By using advanced image processing, advanced robotics, and statistical modeling the robot can work just like a human in order to produce the most yield. The caveat is, it can do it better and faster than any human can. The biggest challenge is variability among every animal carcass. Georgia Tech has created a program called "Intelligent Cutting 2.0 System" which has substantial improvements from its predecessor. The most significant change is the 6 degrees of motion capabilities as opposed to the old, 2 degrees of motion. Having the extra range of motion, allows more intricate cuts to be made, which produces a more efficient overall process. Georgia Tech is also researching the uses of 3D printing in order to produce the robotic arms on certain models of robots, primarily aggregation robots that drive around fields inspecting and spraying plants. 3D printing is a very cost effective and efficient way to make parts or pieces out of plastic, metal, ceramic, and some biomaterials. Researchers at Georgia Tech are exploring making the robotic arms almost completely out of 3D printers to explore the capabilities and limiting factors of using 3D printers in order to produce food grade robotic arms. Carnegie Mellon University is one of the leaders in university research and development of robotics in the country. The National Robotics Engineering Center (NREC) is currently housed at the University where in house Expertise and an abundance of research is available to aid innovation. NREC is currently developing an automated, machine vision-based strawberry plant sorter to aid the process. The sorting stage strawberry harvesting is the most time consuming and costly portion of harvesting strawberries and with the aid of autonomous technology, the time it takes to sort strawberries can be drastically reduced; thus reducing costs and time while simultaneously increasing output. In a field test conducted by NREC in which the machine vision system distinguishes harvested strawberries by appearance, it sorted 75,000 strawberry plants with all different levels of maturity at a rate of 5,000 plants per hour. That 5,000 plants per hour figure alone, dwarfs what a human worker could do. The error rate was about the same as a human's would be, but it sorted plants on a more consistent rate. In October, 2013 the National Institute of Food and Agriculture announced a $4.5 million grant that will be divided by multiple universities including University of California at Davis and will develop relatively small, inexpensive robots to aid in human harvesting of strawberries. University of Central Florida's project focuses on the integration of agricultural robots, low altitude aerial imaging and advanced sensor technologies to enhance early disease and stress detection in fruits and vegetables, including citrus greening. UCF's project will develop advanced control methods for robotic harvesting of citrus. University of Nebraska focuses on the development of semi-automated aerial vehicles capable of sampling water in remote areas, and Washington State University will develop robotic technology for tree fruit harvesting in order to fund research to build prototype robots that will assist in fruit production industry. Even though robots don't make very many mistakes that cause cross contamination they are still in contact with many different sources of contamination throughout the day. Thus, they have to be pressure washed daily. Robots greatly improve the working environments at food processing facilities much better, since they do not get tired, sick, cold, hot, and best of all almost never make mistakes after doing the same task over and over again. Robots don't get colds or coughs, so removing human workers from the food processing can lead to the highest levels of product safety. Questions arise such as, how can these robots withstand constant exposure to salts, alkaline, acids, etc.? A simple hose down isn't sufficient and would destroy the robot completely. Robot manufacturers are developing multiple axis functionality solutions to these problems, such as using food grade grease for the robots joints, adapted sealings, epoxy paint, plastic covers for the arms, and smooth surfaces to improve cleanliness. During food processing, temperature changes can vary greatly from freezing to high temperature cooking. Robots need to be able to adapt and remain operational in those extreme temperature conditions. In extreme heat, heat covers are wrapped around the robot in order to block out radiant heat from harming the robot. The same can be applied for low temperature. Thanks to an innovative Kevlar material made by RoboWorld, robotic arms can maintain their efficiency in extreme temperatures.As was mentioned before, robots that work with food have to be made using certain food grade materials and have to have smoother surfaces in order to reduce bacteria build-up. Due to the increased risk of cross contamination with meat products, the robots used in that industry require the highest food grade rating evaluated by the USDA which is IP69. Most other food processing robots only require a rating of IP67. By removing humans from food processing, it not only reduces risk of sickness or injury, but it also protects the end consumer from exposure to serious illness. With that being said, human workers are still required in order to operate the robots as well as clean and maintain them. Each robot works in its very own 'workcell' where they can move around freely and do their job. As long as the robot is performing its task, human workers can never enter those 'workcells' without properly shutting down the robot to eliminate human injuries. The food processing industry for the last 20 plus years has been implementing more and more robots to their facilities with the efforts to reduce costs, reduce contamination, and increase output. Robot manufacturers as well as leading universities have been working to improve robotic technologies with the intent to create a completely autonomous food processing line; from the chicken coop and agricultural fields on to the processing plant and finally into the consumers shopping cart. All new developments for the automation process of food processing can potentially qualify for the R&D Tax Credit.